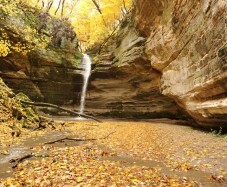 This weekend I took a day trip down to Starved Rock State Park. This park is right on the Illinois River and features a ton of hiking that all lead to some amazing views! The whole area is pretty much a huge attraction, they have trolley rides, rooms for weddings and a hotel that you can stay at. From Whitewater this is about a 2 hour drive, but it is definitely worth the drive! 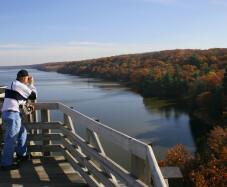 The main thing people go to see is in the picture on the bottom, which is actually the view from the top of Starved Rock but they also go to see the waterfalls like the top. There are about 18 waterfalls in the entire park.